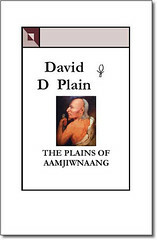 The Plains of Aamjiwnaang relates events through native eyes of famous historical episodes like the establishing of Detroit, the French and Indian War, the American Revolution and the War of 1812. It includes accounts of such renowned battles as Fort Willam Henry, Fallen Timbers, Detroit and Moravian Town and characters like Cadillac, Montcalm and Wolfe, Pontiac, Washington, Daniel Boone, Isaac Brock and Tecumseh. Could you please let me know the source for the drawing of the shaking tent ceremony you illustrate on this website? Thank you. Mr. Moore, the source I have listed for this drawing is the Wisconsin Historical Society Visual Archives: Negative No. WHi (x3) 6031. My name is Daniel Oudshoorn and I just read and enjoyed your first two books. I recently moved to Sarnia and am very interested in learning more about the experiences of the Anishinabek at Aamjiwnaang. I have learned something about recent events due to documentaries like “Toxic Trespass” and “The Beloved Community” as well as other news articles, and I would very much like to get to know some folks and offer whatever friendship or assistance people would like in the ongoing struggle for life, justice, and restitution that your people face. You can contact me at daniel [underscore] oudshoorn [at] yahoo [dot] ca and I hope to hear from you soon. PS — we share the same alma mater; I attended Tyndale for my undergraduate degree but did my graduate degree at Regent College in Vancouver (but I continue to be friends with Steve Thomson and Wafik Wahba, if you happen to have studied with them). Here are a couple of names from our community that are activists in the environmental scene; Ron Plain and Ada Lockridge. They are both on facebook. Nice to hear from a Tyndale Alumnus. I did study under both Steve Thomson and Wafik Wahba. I did my final course with Wafik long distance so I never really met him. I still keep in touch with Jim Beverley, Elizabeth Davey and Paul Friesen. I don’t know when you went to Regent but I have a nephew there now. His name is Jon Rising. Thanks, Dave. It’s been a few years since I was last taking courses at Regent so I don’t think I’ve met your nephew (I am, however, co-teaching a summer school course there next summer, so perhaps I’ll meet him then). I would also be interested in meeting with you, yourself, to learn more about the history of the folks here — if,of course, you have the time and interest. I can always be contacted at the email I provided above.